Highlighting a fundamentally weighted ETF that looks promising, given its investment strategy and current market environment. The exchange-traded fund industry has expanded at a rapid pace. Presently, the industry boasts about $2.1 trillion in total assets under management encompassing more than 1,500 products. Thanks to this, investors can now achieve a degree of exposure to various sectors, asset classes, and strategies that was once all but unattainable. Many of the products in the ETF space follow the conventional passive market capitalization-weighted approach. However, this approach more often than not tags ETFs as nothing more than "market perform" investment avenues, as their returns are more dependent on investor sentiment than on the long-term fundamental health of the component companies. Nevertheless, there are many products that go beyond convention in their quest to generate shareholder returns. 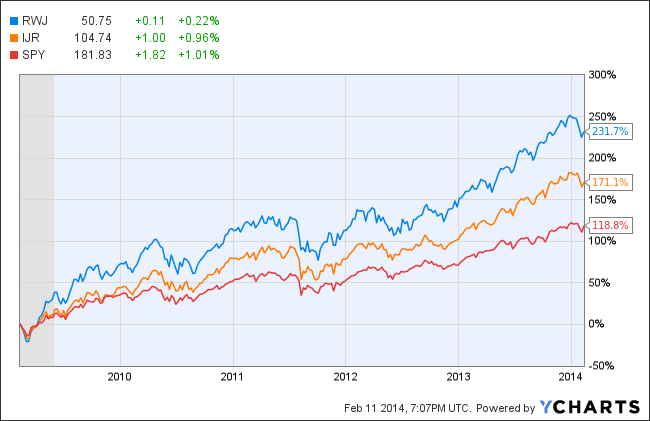 One such ETF that I'm particularly fond of is the RevenueShares Small Cap (NYSEMKT:RWJ) ETF. This is a fundamentally weighted ETF that ranks its components on the basis of their revenue, rather than their market capitalization. This makes the ETF select only those stocks that have exhibited, and are expected to increase, revenue growth. This ensures that the companies seeing the best performances in their core business operations are given the most weight, rather than those that have simply experienced a surge in their market value. And one of the most important factors in a company's long-term growth is a consistent uptrend in the top line. From a sector viewpoint, the ETF has maximum exposure to defensive sectors such as consumer cyclical, which accounts for roughly 24% of its portfolio, followed by consumer noncyclical with a 22% allocation. This is not surprising, as these sectors tend to have less volatile and more sustainable revenue growth due to the defensive nature of their business models. These sectors are followed by industrials, which account for roughly a fifth of the portfolio, and technology, with a weighting of about 8%. Cyclical sectors having a volatile trend in their revenue, like financials, are given less weight. Altogether, the ETF holds about 600 stocks in its portfolio, which is based on the S&P SmallCap 600 Index. To answer this question, I've built a chart comparing the long-term returns of the RevenueShares Small Cap ETF with those of the iShares Core S&P Small-Cap (NYSEMKT:IJR) ETF, which follows the same Index but weights its holdings based on market value, rather than revenue. And to illustrate the broader market sentiment, I threw in the SPDR S&P 500 (NYSEMKT:SPY) ETF. Even though the two small-cap ETFs follow the same parent index, the revenue-weighted ETF has crushed its market-weighted counterpart. Of course, this is not totally unexpected: The market has been on a tear since the pits of the recession in 2009, and small caps tend to outperform in a booming market and underperform in a bear market. Although we have yet to witness an extended and comprehensive bear market since the launch of the RevenueShares Small Cap ETF in mid-2008, we can see that the ETF lagged behind its large-cap-focused counterpart during that brief period of the recession: During that time frame, the RevenueShares Small Cap ETF slumped 43%, while the SPDR S&P 500 ETF lost about 34%. In short, the RevenueShares Small Cap ETF, being a function of the small-cap space, is bound to exhibit a higher level of volatility than the broad market. The ETF also has a major disadvantage when it comes to its expense structure. It charges an expense ratio of 0.54%, which is about three times higher than the expense ratio of just 0.17% charged by the iShares Small Cap ETF. The ETF has a decent asset base of around $249 million. Nevertheless, although the ETF exhibits a higher volatility, the small-cap focus also gives it greater growth potential than a large-cap fund. Further, with the Federal Reserve determined to finally scale back its monetary stimulus, it is finally time for the easy-money era to come to an end. I'm not suggesting that this will cause equity prices to slump, but you can expect the markets to start valuing stocks based more on their fundamentals than on the Fed's loose monetary policy. This makes the revenue-weighted ETF extremely attractive, as it's geared toward fundamentally solid companies with strong revenue streams. Therefore the outlook for the RevenueShares Small Cap ETF, especially given the long-term picture, looks promising. As an analyst and financial writer, assisting the readers in taking more educated investment decisions based on first hand analysis is my primary objective.